There have been so many joys with blogging, but yours consistently inspires and challenges us. 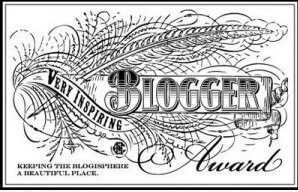 Congratulations on your deserved Very Inspiring Blog Award. I thank Dolly for her friendship and kind appreciation of my posts and art. In the same time I want to thank her for sharin’ cool and capturing stories, pictures, experiences, photos, games and news.